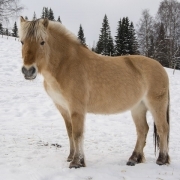 Choosing the right type of horse rugs can be confusing, with many varieties to choose from. With manufacturers giving them their own names, how do you know if they are the same as another type? Today we are breaking down what horse rugs are made from, to help you choose the right one. 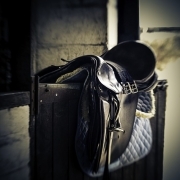 Mesh fabric is a lightweight fabric which offers protection from the sun, allows for breathability and reduces flys and other insects irritating your horse during the summer. Fly mesh can vary from lightweight, loose weave fabric to heavy-duty tight weave. Mesh rugs can be a coarser fabric compared to cotton rugs. If your horse has a very fine or sensitive coat, this can cause rubbing if the rug isn’t fitted properly and cause more harm than good. A cotton rug can be 100% cotton or a cotton/polyester blend. 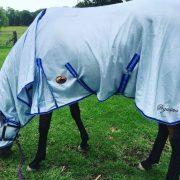 It is a good, general-purpose fabric that keeps the sun off your horse, prevents the coat fading, and helps keep your horse’s coat short in cooler climates. 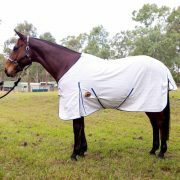 They are also lightweight and give your horse some warmth overnight if a thicker rug isn’t necessary, and protection from insects. Cotton is not waterproof, however, it dries out quickly due to the lightness. 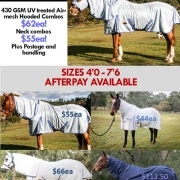 Polar fleece is popular as an under rug, travel rug or stable rug} in the cooler seasons, eg: late autumn/early spring when the mornings can still have a bit of bite to them. It doesn’t have the same durability as a wool rug, but the lower price reflects this. When shopping for a fleece rug, look for anti-pilling fleece for better quality and durability. high airflow breathability and the main benefit of choosing polyester/cotton is its suitability for sensitive-skinned horses. longer lifespan with general use. Pure wool is quite expensive, so most wool rugs are a blend of wool and another fibre. A good quality wool rug will be at least 70% wool. Intended for cold or wet weather, synthetic rugs are most suitable because they are light, 100% waterproof, and dry out easily. 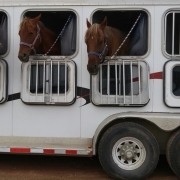 The downside is they do need to be removed when the weather warms up as they are far less cooling and your horse could overheat in them. Some higher-quality synthetic rugs are treated to allow this type of rug to be breathable as well as providing weather protection. These types of rugs can come with a lining such as polyfill, or if they are unlined, they are generally marketed as rain sheets. Canvas offers very good breathability. 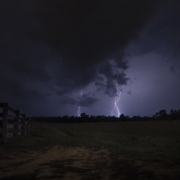 They are very durable in normal paddock conditions and heavy, in particular when wet. It is rain-resistant but not entirely waterproof, so is more suited to the colder/dry climates rather than warm, tropical areas known for high rainfall. There is nothing worse for your horse than a heavy, wet rug. 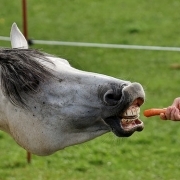 https://www.bangforyourbuckhorsegear.com.au/wp-content/uploads/2018/07/BFYB_PolarFleeceCombo_HighRes-8615_540x.jpg 360 540 BFYB https://www.bangforyourbuckhorsegear.com.au/wp-content/uploads/2018/07/bfyg-logo-min_300x300.png BFYB2019-01-23 13:10:382019-01-24 08:30:38What Horse Rug Materials Are Available?